Screw the rules, he used to have green hair! Kurz: What's up with her hair color? Kalinin: Since when is black hair out of the ordinary? Especially for Japanese people? Kurz: Uh, you mean blue hair? Kalinin: No, I mean black hair! See? It says here right in the book! So you've just watched The Movie of your favorite series. And it was good. There was one detail, however, that they missed. The main character's hair, blond in the original, was brown, and the wacky sidekick's hair was a darker shade of yellow than usual. And why was the villain's jacket orange? It is unclear why matters of color are one of the things executives target first, but it can cause problems down the line if any of the original color choices had symbolic meaning. This is usually excused in the case of Legacy Characters. Usually. It's also generally justified when casting for a live-action version of a work, as most casting directors favor, you know... acting ability over resemblance to the original character. And as shown in the examples, live-action also has different aesthetic considerations to animation, meaning different choices must be made for things to look good. But some fans bring it up regardless. Related to Spell My Name with an "S". Can be related to Race Lift, if the skin color changed with the hair. Though the visual effect can be similar, this is not related to Palette Swap. For when the character is changed so much as to be an entirely different character, that's In Name Only, and this can end up as a Sub-Trope. Dyeing for Your Art can Avert this, though it won't always. See also Hair Color Dissonance, Suddenly Blonde. Hakuro from Ginga: Nagareboshi Gin was black with white markings in the manga, but was changed into light brown with white markings in the anime. Officially, at least – he's somewhat infamous for being frequently colored incorrectly, including being completely blue in one scene. Tesshin aka Chibi was different shades of brown in the aforementioned anime, but colored images from the manga as well as the anime of the sequel revealed him to be gray and white in color. Riki was red and white in the manga, but was colored brown and tan in the anime. Retsuga was originally colored brown and white. Years later, another colored image of him was made, and this time he was blue and white. Seras Victoria from Hellsing received this treatment for the TV series. On the cover of volume two of the manga, she is shown with blonde hair, a yellow-ish uniform, and blue eyes. In the anime, she has strawberry-blonde hair, a blue uniform, and red eyes after she was turned. However, the Ultimate OVA series uses the manga coloration, save for the uniform being a darker yellow-brown shade. Made even more confusing in that the original serialized covers couldn't decide on her coloring at all, and would alternate randomly. Maxwell and Pip have blonde hair in the manga, but they was changed to silver and brown respectively in the anime. Doc has silver hair in the manga and blonde in Ultimate. Rip's eye color went from red to piercing blue. Integra's hair is closer to being white-blonde in the TV series. In the Super Robot Wars Original Generation anime, several characters (Bian Zoldark especially) got more realistic hair colors (black instead of blue in his case), and Tenzan Nakajima's hair was muted from bright green to a neutral brown. In the OVA, the colors went back to normal, even Bian's is blue in a flashback. Bian is an odd case anyway, as even the games can't agree on what his hair colour is. The NES Super Robot Wars 2 had him as a redhead, changed to black in Complete Box (a PSX remake of SRW 2, 3, and EX), then to blue in the GBA Original Generation games and Alpha 3. Then they changed it back to black for Divine Wars and the PlayStation 2 remake Original Generations. Utena started in the manga as a blonde, but was given pink hair in the anime and later manga volume covers and illustrations. A few other characters had some different colors as well, albeit not as extreme. Touga's hair was black (aside from his front locks), as well as Anthy and Akio's. The blue-haired Miki also began as a brunette. Meanwhile, in the movie adaptation, Miki's sister Kanae's hair becomes a light teal, whereas in the anime, it was indigo. Finally Kanae's hair in concept art is a dinghy yellow-green color, while in the anime itself, it's a very light blonde. There was even an Omake that Saito made in the manga where she's afraid when Ikuhara approached her seriously. She thought that he was going to say the anime wasn't going to be made after all, but he was just asking her about colors (He picked the color she didn't choose anyway.). Sailor Moon is quite puzzling in this respect. In the manga, Sailor Moon's hair seems to be shown interchangeably white or pale blonde and changes to white when she is Princess Serenity and in the future when she is Neo-Queen Serenity. In the anime it's golden blonde, and in the live action it's naturally black in her untransformed state, changing to golden blonde as Sailor Moon, and black again as Princess Serenity, but golden blonde again as Princess Sailor Moon. In the live action, everyone except Mars has a hair color change when they switch to scout form. Mars simply has longer hair, but it's still black. Haruka's hair in the manga is white-blonde, but dark blonde in the anime. Executive Meddling: The author originally wanted Sailor Moon to be silver-haired, so she looked distinct from Sailor Venus, but the publishers made her change it to blonde. That didn't stop her to use the silver/white for her Serenity form. Another case is Sailor Jupiter - in the early manga she actually had pink hair, but in the anime it's brown. It is pretty safe to say almost no one has one hair color in the manga. Usagi/Chibiusa has white/blonde/pink hair. Rei switches from red to purple to black. Ami is always blue, but differs in shades (and is heavily implied to be a stylized black). Makoto switches from pink to green to brown (not to mention in one picture, where each of the scouts is given either brown or blonde hair, is blonde). Haruka switches from dirty blonde to white. Michiru is usually green or blue or something in between. Luna is either black, blue, or purple (likewise, Diana switches from light purple to gray). Mamoru goes from dark green, dark blue, dark purple, black, lavender, etc. Ikuko goes from pink (explaining Chibiusa) to purple (and blue in the anime). Hotaru is brown, black or purple ranging from a medium shade to almost black. tl;dr: Virtually everyone but Venus and Pluto. Chibiusa's school friend Momoko is an inter-continuity example. The manga illustrations tend to show her with pinkish or purple hair, similar to Ikuko's. In her early anime appearances during the second and third seasons, her hair was brown. In the fourth season it became purple with no explanation, and still wasn't the same shade as in the manga. PGSM also changed the hair color of most of the Dark Generals: Kunzite went from white to black, Nephrite from brown to red, Zoisite from blond to white. Jadeite is literally the only one who retained the same look. In Ranma ½, female Ranma has red hair in the anime, but there once was an enormous Internet Backdraft over whether or not this applied to the mostly black-and-white manga. Fanciful multicolored-covers and art work aside, fans in favor of the idea rationalized that since curses copy their original victims, it was reasonable that Ranma's curse had just involved a redhead. Fans against the idea rationalized it occurred for the same reason other Takahashi characters got palette changes: to simply to make both versions of Ranma immediately distinguishable to the viewing audience. Not to mention the other girls. Akane's hair was portrayed as merely black or brown in color art. Likewise, Shampoo and Ukyou's hair were both originally just a straight black on the covers. Though this eventually shifted with some cover artwork, all hair within the manga was portrayed as a straight black throughout. In the first anime opening, Shampoo is shown with deep GREEN hair. When she actually appeared in the anime however, her hair was violet. Traditionally, the Yin Yang is represented not as White and Black, but RED and Black. Yang, the Black, is the masculine, while Yin, the Red, is the Feminine. This was probably one reason why Red was chosen over any color. In the Dragon Ball manga, Bulma, her father, and her two children all have purple hair. In the anime, Bulma's father and son still have purple hair, but Bulma and her daughter have blue-green hair. Weirdly, the 10th anniversary movie gives Bulma back her purple hair, but has Goku wearing his anime-only Dragon Ball GT clothes. The 2009 live action movie gives Bulma blonde hair with blue streaks and makes Yamcha blonde. The manga has Karin colored white, brown, or blue. The anime keeps him white. When Vegeta and Nappa appear for the first time they are shown in completely different color. Nappa has brown armor instead of yellow, but Vegeta had red/brown hair and orange and green armor. Their colors are corrected later on, and Vegeta's colors are fixed during his first appearance in Kai. Nappa was ignored for some reason, despite being easier to fix. Kaioshin and Kibito switched skin colors when transitioning from manga to anime. Their costumes are also completely different colors. Piccolo's non-green skin patches are yellow in the manga and a pinkish color in the anime. Goku's gi is a pale yellow color in the manga but orange in the anime. Cell is a dark green color in the manga and a bright neon green in the anime. Most of the auras of the manga, even those of Super Saiyans, are white or a pale blue (if you are to believe the Kanzenban cover art). Kaioken is a darkish red/magenta color in the anime, but it's pure red in the manga. This is fixed for a few episodes in Kai, but it's back to being the dark red/magenta color when they got to Namek. Uub has a green sash, white belt, and orange pants in the manga, but it's all brown in the anime. Pilaf's robots at the Red Ribbon arc's end are different colors in the anime (Blue for Pilaf, pink for Mai and green for Shuu) but they're all orange in the manga. Interestingly, many of the "original manga colors" can be chosen as Palette Swaps in the Budokai Tenkaichi games. In Urusei Yatsura, Lum's hair was rainbow-colored in the manga. The anime made it green. Heavily subject to Adaptation Displacement. In Neon Genesis Evangelion, Asuka's hair is red; in the manga adaptation it is strawberry blonde, while her Rebuild of Evangelion counterpart is depicted with auburn hair. Also, Shinji's eyes go from blue (anime) to brown (manga). Evangelion isn't the only Gainax work here; the summary episode of Tengen Toppa Gurren Lagann has concept art that depicts Nia with strawberry blond hair. Almost all the Gold Saints in Saint Seiya were blond-haired in the manga. For the sake of variety, the anime changed most of them, albeit half of them got blue hair for some reason, thus not helping any. Thanks, Toei. Forget the Gold Saints, what about some of the main characters? Everybody had pretty much normal hair colors in the manga, but some of them got crazy 80's rainbow-hair when the anime adaption came. The most dramatic were brothers Pheonix Ikki and Andromeda Shun, both of whom had brown hair in the manga. In the anime, Ikki's hair is blue and Shun's is kelly green. One could say that their overall color change may be based on a famous pair of brothers. Looking at the latter duo nowadays, this may be true. Matsumoto went from bright blonde in the manga to strawberry-blonde in the anime. Oddly, she gets her original hair color back for one filler episode, 304. Nel's hair is green in the manga, but changed to teal in the anime. Gin's hair has a purple tint in the anime, while the original manga shows it as pure white. In a similar case, the first time his eyes were revealed, the anime decided to make them red. Once the manga revealed his eyes were actually a bright, icy blue, the anime changed his eye color to match the manga. Uryu, Yoruichi, Soi Fon, Nemu, Sun-Sun, Apache, and Mila Rose all have jet-black hair in the manga. In the anime, they were changed to dark purple for Yoruichi and Nemu; blue for Uryu, Soi Fon and Apache; olive-green for Sun-Sun; and brown for Mila Rose. Orihime has brown eyes in the manga, while in the anime they are gray. Yumichika's feathers consist of one pair of solid red feathers and one pair of solid yellow feathers in the anime. In the manga, the feathers are in fact a multi-hued rainbow of color reminiscent of how the tail of a peacock can reflect a rainbow of colours when the light catches the feathers in a certain way. Mahou Sensei Negima has to be the king of this trope. The manga and the first two anime adaptations all use different hair colours. Given the size of the cast, listing all the changes is unfeasible, but it's a good portion of the cast both times. The early introduction OVAs (unlicensed in the US) even changed up a good amount of hair colours, before the first anime series was even released. In fact, we had to give give it its own page! In the Elfen Lied manga, Nana and Mariko have purple and blonde hair, respectively. In the anime, their hair is pink. Mariko's hair still has a blond hue in the anime. A subtle example, but Lucy's hair was more pink in the manga, while it was a more reddish pink in the anime. In the Full Metal Panic! manga, Sousuke was usually depicted as having purple hair. For the anime, this was changed to a more typical black. Ironically, Kaname's black hair in the original books was made blue. Tokyo Mew Mew is a complicated case. In the original manga, the girls' hair always matches their "signature color", transformed or not. In the anime, the colors were changed slightly towards the darker and less outrageous shades for the girls' regular forms, changing to their much brighter "signature colors" as they transform into their Mew Mew forms. The most noticeable case is Ichigo: pink-haired in both forms in the manga, but has dark red hair in her regular form in the anime, which only changes to pink when she becomes Mew Ichigo. Go figure. In the Kinnikuman anime, Robin Mask goes from silver to blue, Ashuraman from blue to a normal skintone, etc. A rather unfortunate example is the Kinnikuman Great disguise, which is dark red in the manga, but black in the anime, giving the wearer a distinct Kentucky Minstrel look, which is probably why the Kinnikuman Nisei anime went with the manga colours (though amusingly, Robin's son Kevin uses Robin's old anime colours). Robin Mask also wore dark blue tights under his armor in the anime, making his skin appear blue. Kinnikuman almost always wore red trunks and boots in the anime, while in the manga they were usually white. Brocken Jr. had whitish skin and a dark green/black outfit in the anime but normal skin and green in the manga. Heck, a majority of the characters had different outfit and/or skin coloring in the anime. Several character's hair color in Excel Saga changed when it was turned into an anime. Excel hair changed from blonde to oragne, Hyatt went from Brown to dark blue, Il Palazzo went from pale green to pale violet, and Dr. Kabapu went from green to blonde. Disgaea: In the games, Etna's hair is bright red, while in the anime adaptation, her hair is a much darker maroon-ish color. Canon Immigrant Ryo Akiyama of the Digimon franchise's first appearances in color, in the Anode and Cathode Tamer games for the Wonderswan and in Digimon Adventure 02, have him with brown eyes. By the time he reaches Digimon Tamers, his later games, and the rerelease of his first games, his eyes are blue. Seto Kaiba of Yu-Gi-Oh fame had green hair in the original Toei anime, which was then changed to brown for Yu-Gi-Oh Duel Monsters. His eyes also changed from brown to blue. "Screw the rules, I have green hair!" 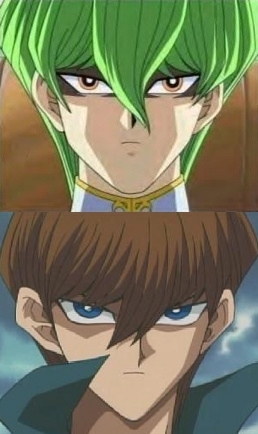 Perhaps as an homage to this, the anime's filler villain, Noah looks very much like a younger version of Kaiba's old design. Likewise, Anzu's/Tea's eyes change from brown to blue for no adequately explored reason. And Bakura has white hair and blue eyes, but the Toei anime gave him blue hair and green eyes, and the proceeding anime gave him brown eyes. In the Gravitation manga, Shuichi's hair is black (except for when he temporarily dyes it blond in later volumes), and it's safe to assume that his eyes are a normal black or brown. The OVA gives him dark red-brown hair and green eyes, and the later anime adaptation tops it by giving him bright pink hair and purple eyes more representative of his hyper personality. Some of the covers for the manga volumes however, give him various different hair colors, including pink and violet. In the live-action Death Note movies, Misa Amane has the brown hair natural to her actress, instead of the blonde she had in the manga. Other characters were given relatively normal Japanese hair, but hers stood out the most. Matt was meant to have green hair, but his hair was auburn-ish/maroon in the anime. The anime Princess Princess has a bad case of this. In the anime the originally black-haired main character Tooru has blue hair, brown-haired Mikoto and Akira have respectively pink and green hair. The only character in the main quartet untouched is the blond-haired Yujiro. A clothing example can be found in Naruto with Tenten, whose one shirt was blue in the manga but pink in the anime. Kiba sported a red jacket in the early manga too. In a non-human example, the Three-Tailed Beast went from sea green to gray in the anime. When Gaara is first introduced in the manga, his hair looks and is described as being brown, but it later changes to red. Konan has grayish blue eyes with a gold tint in the manga, but her hologram in the Shippuden anime has deep amber eyes. Also, in part 1 of the manga, on the coloured manga covers, Sakura's headband, shorts, and shoes are green, and she sometimes wears green nail-polish and even eye-liner. In the anime, her headband, shorts, and shoes are blue, and she wears no makeup. Sakura actually wore several different shorts in the manga, varying in both color and length. The anime had her constantly wear the same black slightly-above-the-knees shorts all the time. The Rinnegan suffered this for a long time in the anime, though this was due to a lack of colored manga pages for it rather than any sort of intentional choice. Once it was shown in the manga all anime appearances after that were changed to match it. The lack of colored manga pages for the Rinnegan also meant it took a very long time before it was clear that it looked different from Kurenai's unusual but non-powered eyes. A partial example is the Rasengan: Word of God is that he's never decided upon one color for it to be (artbooks and colored covers have shown it to be red and yellow) but in the anime the basic one's color is a bright, glowing blue and the Rasenshuriken is bright glowing white. Naruto's chakra has been described as orange and a lot of colored art shows Rasengan as orange under most circumstances (it changes red but that's due to the technique he's using). Relatively early in the manga, when he first began to train with Jiraiya, when describing his own Chakra Naruto stated that he felt that it was Yellow, or at least that was the colour he associated with it. This was changed to blue in the anime. However, when describing the Kyuubi's Chakra, he stated that it felt red, which was shown consistently in both manga and anime. A mild example but the anime removed the makeup that Sakura always used to wear pre-timeskip. Axis Powers Hetalia had an official chart of the different hair and eye colors on the author's blog. The anime slightly lightened or darkened the hair of almost every character. Examples of this include Sweden being changed from a light blond to a brunette (before switching back to blond in his later animated appearances), Italy's hair changing from brown to auburn (sometimes a saturated red), Belarus going from platinum blonde to dark blonde, China's black hair changing to brown, and the other blond characters either having their hair darkened or changed to a more saturated yellow shade. Himaruya himself has also been inconsistent when it comes to hair and eye colors: Prussia originally had dark blond hair and blue eyes, but now his hair varies from being platinum blond to outright white or grey, while his eyes are now either red, "red-violet", or pink. Russia, Finland, Latvia, and Iceland originally had blue eyes, but appear with violet ones in later illustrations. UK's shade of blond varies throughout all colored illustrations, Canada's hair was originally two-toned, and Hungary is either a blonde or brunette. Monaco was also originally a brunette with brown eyes, but was quickly changed to a blue-eyed blonde. The anime furthers the eye color confusion by giving Finland brown eyes (he had blue/violet in the manga), while changing Lithuania and Estonia's green eyes to blue, Latvia's violet eyes to an aqua blue, and the Italy brothers' brown (Veneziano) and green eyes (Romano) to gold. Sweden's eyes were also initially changed from green/blue to brown, but were reverted in his later appearances. Kurama of Yu Yu Hakusho had dark hair in the manga (usually a stylized black with blue highlights, sometimes a blatant violet), but bright red hair in the anime. Genkai originally had strawberry-blonde hair in colored illustrations, while the anime gave her pink hair. Yusuke and his mother's hair also shifted between being black and brown in the original manga, while Kuwabara's hair changed from black to brown to an orange-ish shade (while orange-red in the anime). Botan's hair was alternatively blonde or blue in the manga, but the anime settled on the latter. Sensui's eyes were originally brown in the manga, but they were turned blue for the anime. Seeing as Sensui's character fits in with all three blue-eyed subtropes at once, this could be seen as a change for the better. The Ame-Warashi has blue hair in the xxxHolic manga, but it was changed into red for the anime. Particularly disconcerting since she's the spirit of the rain and all. On a subtler note, Watanuki and Domeki have the exact same skin tone in the manga, but the anime made them much paler and darker respectively. Al and Hohenheim have dark blonde hair in the first anime. Al also has grey eyes instead of blue. In the first anime, Kimbley has gold eyes. In the manga and Brotherhood, they are blue and it's a plot point. Envy's hair is shown to be black in the manga, but is kept green in both anime series. Winry's bandanna is red in the first anime and green in the manga and Brotherhood. In Toei's anime version of Fist of the North Star many of the characters have their hair colors changed from the manga, with Yuria's hair being changed from black to red (violet during the Shin arc), Raoh's from blond to black, and Rei's from black to light green. Justified with Amiba, whose hair was changed from black to white since Toki (the man he is supposed to be impersonating) is supposed to have white hair due to his radiation exposure (this fact was only revealed in the manga after the Amiba arc was over). The later anime versions by North Stars Pictures reverted back to their manga colors. Most of the video game adaptations tend to stick with the manga colors for the characters. Even Amiba has his manga colors in the Dynasty Warriors spinoff Hokuto Musou. An exception was made with Yuria and Mamiya, who both use their anime hair colors in Hokuto Musou (purple and red respectively, although Yuria's hair was only violet during the Southern Cross arc). Touko Aozaki of Kara no Kyoukai originally had short blue hair in the novels, but when the series was adapted to film, her hair was changed to red and long to make her resemble her sister Aoko, and subsequent artwork has always shown Touko with red hair. The three Mortar Headds used by Juba & his goons at the end of The Five Star Stories film had their paintjobs inexplcably changed in the anime movie based on the manga. In colour illustrations, the Hellmine was depicted as white with blue highlights, while the film version is dark pink (this may be due to the fact that the white version looks extremely similar to Zeta Gundam's Qubeley, which is not surprising, considering they're both designed by Mamoru Nagano). The Barunja & Devoncha, meanwhile, went from gunmetal grey to two different, similarly loud colour schemes, probably because they thought the originals looked too boring. In the first anime special based on the Fatal Fury games, Andy Bogard is represented with silver hair instead of the blond that he has in the games. In later anime, Mai also gets red hair, while in most games she appears in her hair is brown. Bartholomew Kuma fame was originally introduced in the manga wearing an orange outfit. In the anime, he wears black. The next time Kuma showed up in a color page in the manga, the color of his outfit had been changed to be closer to the anime version. Doflamingo was initially depicted with a darker red and black clothing scheme in the anime, but later it was changed to the manga's orange and white coloring. Crocodile's new outfit in the anime is depicted as consisting of a brown suit, indigo scarf, and a dark green overcoat, while in the manga his scarf is green and both his suit and overcoat appear to be black. A less noticeable display of Adaptation Dye Job in the anime involves characters' eye colors, as Oda very rarely, if ever, colors them in. Some examples include Robin having blue eyes in the anime (brown in the manga), Mihawk having yellow eyes to reinforce the Animal Theme Naming, and Hancock having navy blue ones. Milly from Trigun was originally a blonde ditz in the manga, but was changed to a brunette in the anime. She's still a ditz though. In the anime Legato has blue hair and gold eyes and in the manga has deep purple hair and bronze colored eyes. There's a variation for Vash—in the manga, his hair starts to turn black as his power drains. This is absent from the anime. In the Gungrave anime, Brandon has grey/silver hair after being exposed to necrolyzation. In the games he's depicted as having black hair even after his revival, along with a darker skin tone. Both versions have yellow/amber eyes though. Tons in Inuyasha. For example, Sesshomaru's kimono has a pale purple pattern in the manga, which the anime changes to red. A similar change happened to Kagura's kimono. Tohru from Fruits Basket has brown eyes in the manga and blue eyes in the anime. Also, pretty much everyone had some change made: Yuki went from silver hair and eyes to dark gray hair and dark purple eyes, Kyo went from orange eyes to dark brown eyes, Kagura went from dark brown eyes to grey eyes, Momiji's and Hiro's eyes switched to a slightly darker shade of brown, Haru's eyes went from grey to dark brown, Ayame's eyes went from light grey to yellow-green, and Kisa went from yellow-orange hair and eyes to strawberry-blondish-orange-ish hair and dark brown eyes. In the Video Girl Ai manga, Ai's hair is blond (as seen in the covers). In the OVA, they changed it to grey. And not grey like silver, grey like lead. The anime version of Ouran High School Host Club changed Tamaki's light brown hair to blonde, probably to emphasize his French heritage. Really? Every official manga coloring of him has shown him with blond hair. Early manga scans show him with medium to light brown hair while later scans have him with blonde. The twins hair also changed from brown to red. Tenjho Tenge's Aya had her hair go from being very dark brown in the manga, to a light ginger-blonde in the anime. Kiddy Phenil of Silent Moebius has green hair in the manga and movies, but turns into a redhead for the TV series. In the light novels of Suzumiya Haruhi, Haruhi's hair is black, Yuki's is gray, and Mikuru is a brunette. In the anime, Haruhi's hair is dark brown, Yuki's is grayish-purple, and Mikuru is a redhead. Both Yuki's and Mikuru's anime hair colours are close enough to the ones they are supposed to have that it could be seen as a simple stylistic choice. Haruhi's hair is definitely not black in the anime, though. In the Miracle Girls manga, Toni and Mika have dirty/sandy blond hair, while in the anime it's brown. Chris also has pink hair in the manga, but brown in the anime. In the Mermaid Melody Pichi Pichi Pitch anime, transformed Rina has medium-green hair, and Seira and reformed Sara always have orange. In the manga, mermaid Rina's hair is practically neon, and the orange ladies have dusty brown hair as humans. Ai Haibara of Detective Conan has very light strawberry blonde hair in the manga and light brown or auburn hair in the anime. Shinichi Kudo's mother also goes from blonde to brunette, as does Ran's friend Sonoko. In the original Science Ninja Team Gatchaman, Jun had hair that shifted from being a deep green to a more blackish or brownish color at times, to where some fans assumed that it was simply meant to be so black that it only SEEMED green. In the sequels and later official artwork, it was brightened to an emerald shade. The OVA version made in the '90s opted to give her mousy brown hair, while in the animated NTT ads, it was practically chartreuse. The concept art for the OVA version also shows that they initially considered giving her blue hair before settling on the brown, along with blue eyes. Joe's hair has varied between being a dark, dirty blond/light brown shade, medium brown, auburn, and a very deep brown through the series and related materials. The OVA seemed to decide that hair which blended into the main character's hat was about the extent of weirdness that the main cast would have, so supporting character Noriyaki Kakyoin had his hair recolored from hot pink to natural brown. At least he kept his side hair. The manga never seems to make up its mind as to the 'true' hair and clothing colors of the characters, however. Giorno can be wearing bright pink in one illustration, and black in another. School Rumble's manga makes it clear that the majority have natural, traditional black hair, yet the anime adaptation decided to give every other character different shades CLOSE to black ranging from dark green (Karen) to blue (Mikoto). In Cardcaptor Sakura Sakura has blonde hair (sometimes with reddish tones) in the manga, but the anime gave her brown hair instead (which people sometimes interpret as "auburn" for whatever strange reason). Syaoran is also given brown hair, but this is more excusable since one color card in the original manga arc depicts him with brown hair (although in the artbooks, his hair is always blond as well). Tomoyo's eyes are purple in the manga and blue in the anime, but they switch to dark brown on the Clamp in Wonderland 2 music video. Sakura's mother, Nadeshiko, has light brown hair in the anime; one color drawing in the manga has her with dark violet hair. In the manga, Eriol’s robes are black, and the rim on the collar of the cape and the ends of the sleeves is red, but in the anime, the robes are dark blue, and the rims are light blue. The color of Zatch's/Gash's mantle in the manga version of Gash Bell is green or sometimes yellow. In the Anime, it's always blue. Mitsumi from Pokémon Diamond and Pearl Adventure has green hair, but the character she's based off of, Dawn from the games, had black/dark blue hair. To be far, Mitsumi has a radically different hair style in general, as well as a different body type. Chii from Chobits has been shown with white, gray, and various shades of blonde in the manga, and her eyes were amber colored. The anime gave her yellow hair and brown eyes. Zelgadis Graywords of the Slayers anime has light blue skin (as he is a chimera), lilac-colored hair, and navy blue eyes; in the original novels that the show was adapted from, his skin is said to be more blue-green, his hair is silvery, and his eyes are purple. The Non-Serial Movie Slayers Premium featured the novel-designed version of him. There is also a small bridge of stone that is stuck between his left eyelids in his novel design that isn't seen in the anime. Interestingly, he's an odd case of Art Evolution where current art of him matches his anime design. Lina the protagonist began as a brunette in the Light Novel series; for the older anime series and later books, it became a coppery color, and currently, it's a very bright red. Xellos the demonic priest and Princess Amelia have black hair in the novels with stylized purple highlights, while anime adaptations make their hair straight-up purple. In the Wedding Peach manga, Yuri (Angel Lily) had blonde/dirty blonde hair, but it was changed to brown in the anime. Hinaguki (Angel Daisy) also seemed to have blonde hair, which became green in the anime. Potamos's blonde hair was changed to purple, too. In the first season of Magical Girl Lyrical Nanoha, Precia Testarossa's hair was a sort of violet-tinted grey. In the Movie remake several pieces of official movie art but not the movie itself, it's very much pure, dark violet. Bobobo-Bo Bo-bobo: Softon's ice-cream swirl-esque head is brown in the manga (denoting it as poop, hence the jokes), and pink in the anime (denoting it as ice cream, subbing out the "poop jokes" for the sake of censorship). Beauty's hair is also a deeper shade of pink in the anime than in the manga. Considering poop is sometimes colored pink, this might be a literal case of Getting Crap Past the Radar. Saburo from Sgt Frog made his TV debut as a minor character in Seven of Seven. As DJ 623 (Mutsumi), his hair is bright blue, but in the Sgt Frog anime, his hair is whitish-grey. Wandering Son has eye variations. Everyone has either Black Eyes or Brown Eyes in the manga, as the series prefers to be realistic. However for the anime the eye colors were changed for a majority of the cast. This includes Eyes of Gold, Purple Eyes, and other Technicolor Eyes (even red eyes for one character). Misao from Lucky Star has black hair in the manga, compared to her iconic brown appearance in the anime. In Psychic Detective Yakumo, in both manga adaptations and the novels, Haruka has matching brown hair and eyes. In the anime adaptation, she has pink hair and light Purple Eyes. Her hairstyle also varies between adaptations. In Full Moon wo Sagashite, Mitsuki has black hair and gold/blue eyes in the manga but the anime changed them both to dark brown. (Ugh) Her mother and grandmother went from blonde to brunettes, Takuto's hair went from black to grey, Madoka went from purple to dark red, and Aoi went from green-haired to black-haired. Meroko's shinigami outfit also changed from black to red but this change was chosen by Arina herself. Only Takuto, Meroko, and Izumi were able to keep their original eye colors. Everyone else's were changed. In Devil Hunter Yohko's first illustrations (and manga) Yohko is portrayed with black (or very dark brown) hair and green eyes; the anime changes them both to a dull brown. (Again, ugh) Haruka had lavender/pink hair with a blue bow and white outfit and the anime gives her dark green hair, a pink bow, and a red outfit. Azusa's colors are completely changed as well. In the Natsume Yuujinchou manga, Natsume Takashi has white hair and silver eyes. The anime changes both of these to gold. The OVA of Angel Sanctuary gave Kurai periwinkle hair, while it is silver in the manga. In the original Soul Eater manga, Liz is a blonde. In the anime adaptation, her hair is changed to a light brown. Medaka Box seems to be going in this direction, at least for the more minor characters - in the very first episode, Moji's hair went from being brown to bright blue. Not a complete adaption dye job, but the Kodomo No Jikan mangaka can't seem to make up her mind on the hair colors of Rin and Mimi. Both have had orange-red, sandy brown, strawberry blonde, and light blonde as a hair color at some point. The anime manages to settle on blonde for Rin, but Mimi's hair still fluxes from light brown to orange-brown to some sort of pinkish brown. Houin-sensei changed from blonde in the manga to redhead in the anime. In more recent colored manga chapters, though, Houin-sensei's hair is a more orange color, between the original and anime coloration. In the Magi Nation game (video and card), Kid Hero Tony Jones was a blond. In the cartoon show, he inexplicably went black-haired. Lana Lang and Lois Lane swap hair colors for Smallville. Also, for the record, Kristin Kreuk is part-Asian. This is ignored on the show. Has there ever been a live action Jimmy Olsen with red hair? Ever? Batman usually has a lighter shade of hair when he's played by a real actor. Likewise, in The Dark Knight, Harvey Dent, who is a brunet in the comics, is played by blond Aaron Eckhart. Vicki Vale is normally shown as a redhead in the comics, but was played by the very blond Kim Basinger in the original Batman. While Catwoman is traditionally depicted as having dark black hair, the extremely blonde Michelle Pfeiffer played her in Batman Returns. This appearance was originally used for Batman the Animated Series since the series was intended to tie-in with Batman Returns. However, when the show switched networks and art styles, Catwoman returned to her black hair color and the change was even explained away as a result of a dye job because her original hair product had been derived from animal testing. In Batman and Robin, red-headed Barbara is a blond played by Alicia Silverstone. Of course, this is also a different Barbara. An odd example within one medium: The second Robin, Jason Todd. Pre-Crisis, he had red hair (kind of strawberry blond), permanently dyed black. Post-Crisis, he had naturally black hair. After coming back from the dead, he started out with black hair with a white streak, but now has dark red hair with a white streak, since the dye has apparently grown out. Now with the reboot, he's back to black again. John Constantine was originally blond, and specifically modeled after Sting (and more specifically, Sting as he appeared in the movie Quadrophenia). In the movie adaptation, he is played by dark-haired Keanu Reeves. But then, Keanu-Constantine had pretty much nothing in common with the comic-book character, except for the name (which is pronounced differently in the comic). The hair is really a minor detail. The Hellboy franchise did this to Liz Sherman: Red hair in the comics, black in the live action movies, and some shade of brown in the animated movies. Abe Sapien also received a color change, going from green-skinned in the comics to blue-skinned in the movies. Highly likely changed to allow the Green Screen process to work. Hawk originally had blond hair in the G.I. Joe comics, but was given black hair in the animated series to distinguish him from Duke, the other blond-haired G.I. Joe leader (who actually appeared before Hawk in the animated series). The toyline followed suit by giving pretty much every Hawk action figure released afterward black or brown hair. Superman: The Animated Series had Green Lantern Kyle Rayner's hair changed from black to light brown. Minor GL Corps member Iolande has black hair in the comics, but was given silver hair in Green Lantern Emerald Knights and purple hair in Green Lantern: The Animated Series. Iceman went from brown hair to blond when animated for Spider-Man and His Amazing Friends. Blond Johnny Storm went from blond to brunette when they brought Fantastic Four to film. Ben Grimm went from brunette to bald. Lex Luthor's female bodyguard Mercy had brown hair when she was first introduced in the DCAU, but was given blond hair when she was brought over into the comics. Storm's eyes are blue, but in the X-Men movie, they're brown because Halle Berry refused to wear contacts. Notably she's the only exception. Sabretooth's Tyler Mane wore contacts, Nightcrawler's Alan Cummings wore them, and so did Mystique's Rebecca Romijin. The Joker's sidekick Harley Quinn is almost always portrayed as having blond hair, but sported dyed white hair in Batman: The Brave And The Bold. Dean Cain has brown eyes and brown hair; Tom Welling has green eyes (if fan sites are to be trusted) and brown hair; both played Superman, whose piercing blue eyes and black hair have been part of the standard character description for decades. At least Christopher Reeve was right. Peter Parker has brown eyes in the comics; in the movies, Tobey Maguire plays him, who has blue eyes. Although in the comics, they flip-flop between brown and blue so much eventually Marvel officially stated they were hazel as compromise. Wonder Woman has black hair... except when portrayed by the blonde Cathy Lee Crosby. On the opposite end, her mother Hippolyta was brown-haired in the Golden Age, blonde in the Silver Age, then dark-haired like her daughter after Crisis on Infinite Earths, blonde in the Justice League animated show, black-haired in Batman: The Brave And The Bold, and is now back to blonde in the comics. Although Splinter's brown fur is usually kept in adaptations, it was turned gray for the second cartoon. Also in the original underground Eastman and Laird comics, whenever the Turtles were depicted in color, their masks were uniformly red. They were colored coded for the kids' convenience in all other depictions except this one. A brunette during her tenure in the comic books, Sally Avril was turned into a blonde for The Spectacular Spider-Man. Scott Pilgrim's ex-girlfriend Envy, lead singer of The Clash At Demonhead, was a redhead in the comic but a blonde in the film. The Guardian is portrayed as a blonde in the comics, but is given red hair Young Justice in order to highlight his relation to Roy Harper. Wendy Watson from The Middleman has orange hair in the original comic series, and was played by black-haired Natalie Morales in the TV series. The most recent comic, which is actually set in the TV continuity, uses Morales' appearance. Spider-Man villain Doctor Octopus is almost always portrayed as having short brown hair, but sports long black hair in the Ultimate Spider-Man animated series. Matt and Hay Lin's grandmother from WITCH both got black hair in the cartoon adaption of the comics (whereas they usually have brown and grey hair respectively). There was a story progression dye job for Beast Boy of Teen Titans fame. Back when he was in the Doom Patrol, in his original origin story he was shown to have brown hair. After 12 issues he was given Hair of Gold and it's stayed that way. His hair was returned to brown in Young Justice. Harold Ramis' brown upright Eraserhead-esque hairdo was replaced with a blond pompadour and rat-tail when Egon Spengler was translated from movie (Ghostbusters) to cartoon form (The Real Ghostbusters). Likewise Ray's hair went from Dan Aykroyd's brown to red. In case this wasn't enough to distinguish the main characters, they all got different colored uniforms as well. Agent L was a brunette in Men in Black, but in the cartoon, she was blonde. Of course, the show seems to be in an alternate continuity of some sort (K is still active), but still. The official explanation is that Men in Black is a movie in the reality of the animated series as well. Sarah Chagal (played by famously blonde Sharon Tate) had straight red hair in The Fearless Vampire Killers!, or, Pardon Me, But Your Fangs Are In My Neck. In the stage version, Tanz der Vampire, she's a curly-haired brunette. Magda, the maid, was blonde in the movie but has red hair in the German, Austrian and Japanese productions of the musical. (She's still blonde in Poland and Hungary). Alfred is an interesting case- brunette in the film, but onstage has basically whatever hair the actor has. This leads to the need for the costume department to make a wig that looks like the actor's hair for his dance double in the Act II Dream Ballet. Except for in the Hungarian version, where for some reason Alfred's dream ballet double has a freaking buzz cut. Honey I Shrunk the Kids: Amy has blonde hair in the movies, but in the T.V. series, she's a redhead. 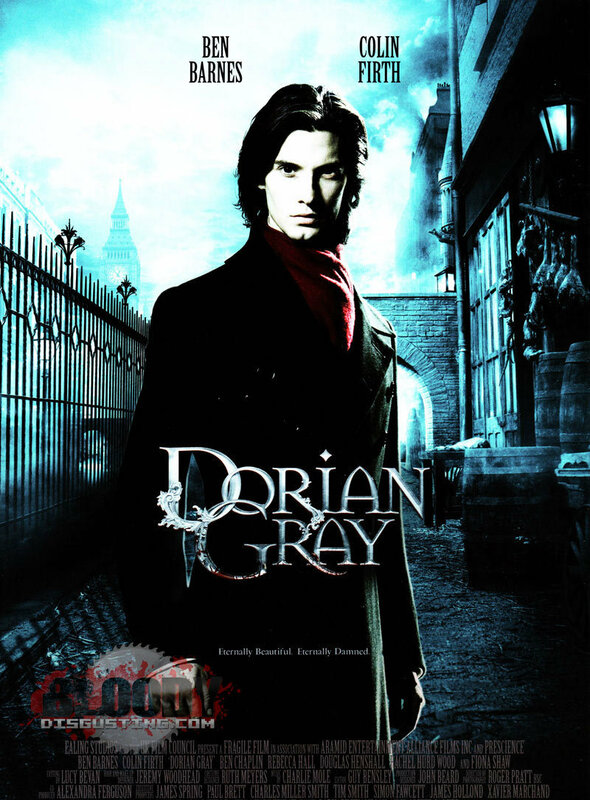 Dorian Gray is an angelic-looking blond in the novel, but a lot of adaptations make him a brunette. The most recent film cast Ben Barnes in the role - aside from fitting the "handsome" part of the character description, he couldn't easily be more different from the literary Gray. In the book Lord of the Flies, Simon's hair is black. In both film adaptations, the character has bleached blonde hair. In the adaptation of the E.M Forster story Maurice by James Ivory, Maurice is blond rather than dark-haired, even though (as David Leavitt wrote in his introduction to the 2005 Penguin Classics edition of the book) "Forster makes so much of Maurice's hair being black. For Forster, black hair connotes virility." The Riftwar Cycle has been adapted to video game form and to graphic novel form. In one of the games, Betrayal at Krondor, the magician Pug - who in the books is described as having dark brown hair and a beard and usually wearing a black robe - has shoulder-length blond hair, is clean-shaven, and wears a white robe. Similarly, Locklear is described as having wavy blond locks in the book, but in the game his hair is chestnut brown. This is even Lampshaded when he meets an old friend. In the graphic novels, the elf queen Aglaranna - who is described as having reddish-gold hair that contributes to her overall soft and angelic appearance - is given bright scarlet hair. In The Vampire Chronicles, Armand is described as having auburn hair. In the Film of the Book, he has exceptionally dark brown or black hair. Of course, the idea of costuming Antonio Banderas as a "Botticelli angel" would have been patently ridiculous. Also Lestat, who in the novels has very long and blond hair gets a dark pseudo-pageboy cut in the Queen of the Damned movie. And Marius who likewise was supposed to be long-haired blond gets short, slick black hair in the same movie. In the original book version of The Dresden Files, Murphy is a tiny blonde. In the TV adaptation, she's a tall brunette. Not just that, she was Irish-heritaged in the novels and described as the cheerleader's younger sister or some such nonsense. In the series, she was Mexican-heritaged and not at all as cute as the book version was. Basically, Susan and Murphy look like each other's book counterparts because the actresses were determined to be much better for each other's roles than the roles they were initially cast for. HP Lovecraft described Herbert West: Re-Animator as being blond in the original story, but thanks to Jeffrey Combs's inimitable portrayal, any work featuring him is bound to have him with brown hair (aside from the bizarre Humongous Mecha anime Demonbane in which it was green). Charles Dexter Ward was also blond, but both film adaptations give him dark hair. In Harry Potter, the protagonist's eye colour changes from green in the books to blue in the films (blue being Radcliffe's natural eye colour and green contacts being extremely uncomfortable) and in the film his hair is somewhat lighter depending on how the reader interpreted "jet black hair". This is particularly Egregious due to the fact that people are constantly mentioning that Harry has his mother's (green) eyes and otherwise, looks like the spitting image of his father. Lily's eyes were changed to blue in the films to match. In other words, Lily and Harry have both had an Adaptation Dye Job. Lily's hair colour in Harry Potter and The Chamber of Secrets changed from dark red in the book to a light ginger in the film. In a strange half example, Narcissa was given two-tone hair for whatever reason. Luna Lovegood's hair is described as "dirty-blonde". In the movie it is platinum blonde, which is especially odd since J. K. Rowling says Evanna Lynch looks exactly how she pictures Luna. Matching her son, Aunt Petunia's hair is also changed from blonde to dark brown. 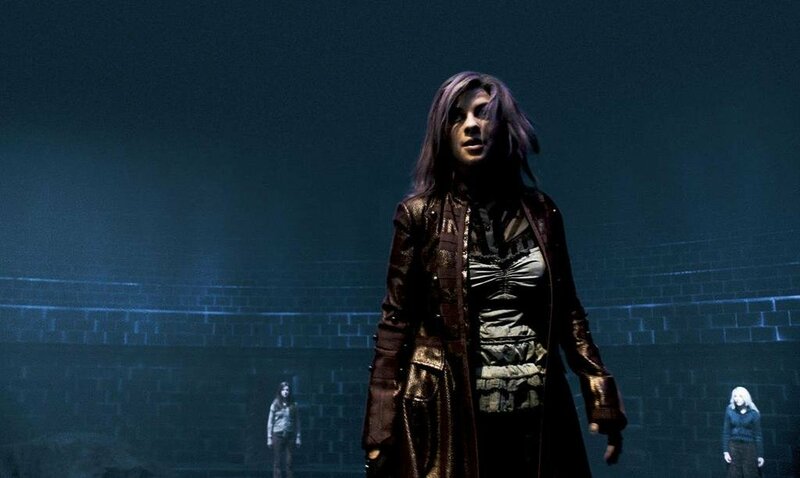 Depressed!Tonks' mousy-brown hair doesn't make much of an appearance in the films. In fact, pretty much her whole appearance is changed. In the book, she alternates between pink and purple hair, and she is shown dressing slightly punk-esque, wearing stuff like a Weird Sisters T-shirt and combat boots. In the film, she dresses rather conservatively, and looks like a normal woman. James Potter winds up being blonde in the sixth movie. Firenze the centaur, described in the book as blonde with a palomino body (i.e. quite light overall) becomes pitch-black in the movie. This is probably due to the fact that blonde hair is harder to animate with computer graphics. There is some confusion about Tycho Celchu's hair color. In the comics, it's almost always blond. In the novels, by the three authors who will include him, sometimes it's blond, sometimes it's pale brown. It's never been directly addressed, but fans generally speculate that since these discrepancies never take place very soon after each other, it's because he has had time to either dye it or allow it to be bleached by sunlight. It is mentioned several times in The Chronicles of Narnia books that Lucy Pevensie has Hair of Gold. She's a brunette in the films. Prince Caspian was also a blonde in the books, but brunette in the film. As well as Edmund and Peter, who have blond and dark hair respectively in the books, but their hair colors are reversed in the movie, Edmund being dark-haired and Peter fair-haired. The fans seemed to like the movie version better, due to Edmund's Anti-Hero status that fitted really well with his dark appearance, which was in contrast with the other Pevensie children's, who were more fair. Susan keeps her original hair, being dark-haired, too, but don't worry, she will display her vicious side later, when she will refuse to believe in Narnia and fall in disgrace (according to the books, in a roundabout way) because she likes parties and lipstick. So, apparently, the dark-haired siblings are portrayed to fall into the dark side at least once, while the other two, who are more blondish, are the good ones. Oh, it gets even better. Skandar Keynes, Edmund's actor, is half-Arab. Arabs aren't portrayed well in the Narnia series, let's leave it at that. Accidental Unfortunate Implications to be sure, but still a bizarre thing to have happen. Funnily enough, Skandar Keynes has been chosen especially for Edmund's role, because the director considered him to be darker than his co-stars. Eerie Pale-Skinned Brunette, mischievous, snarky and the facts that he wore more black and listened to heavier music created his Anti-Hero image on the spot. Oh...and he's an atheist. The Pauline Baynes illustrations, which were commissioned specially by Lewis himself and have been used in many editons of the text, portray Lucy with black hair and Susan with lighter hair, despite that Lucy is, again, stated to be blonde, and Susan is black-haired. Mark Wing-Davey, who played Zaphod on radio and TV, is quoted as saying that he said he thought Zaph was "a blond beach bum" (with the implication that he'd have been quite happy to wear a wig), but the producer/director (Alan Bell) wasn't listening to anyone involved in the radio show. The illustrated book also has a dark-haired actor playing Zaphod. This gets lampshaded: the description of him as blond has a footnote added to it saying that anyone perceiving him as otherwise is probably suffering from Mad Human Disease. In the book series, Trillian was described with dark hair. When the series came to television, she was played by blonde American Sandra Dickinson. This was done on advice of Douglas Adams himself, who liked Dickinson on the role. In the Sword of Truth book series, Darken Rahl is described as having distinctly blond hair, but has black hair in Legend of the Seeker. The main character in the Deltora series is blond in the anime adaptation but not blond in the original book. Boromir in Fellowship of the Ring is described as having dark hair. For the movies they gave him light brown, bordering on blond. They needed a way to make Boromir and the dark-haired Aragorn instantly visually distinguishable, and putting Boromir in a Viking helmet had been ruled out. Legolas also has dark hair in the books. In the Howl's Moving Castle book, Sophie has "reddish straw-colored" hair. In the animated movie, she has brown hair. Also, in the scene where Howl throws a fit because Sophie messed up all his hair potions, his hair was supposed to go from "mud" to the "reddish straw" thing (but pinker), but ended up getting from a yellow-blond to... wet-colored yellow-blond. Then to black because he throws a fit. There was purple in there too. Marisa Coulter is described as having black hair in His Dark Materials, but is played by blonde Nicole Kidman in the film of the book. Word of God is that Pullman liked this better anyway. Kidman also played another originally dark-haired character, Ada Monroe, in the film version of Cold Mountain. In the Inheritance Cycle, Arya has black hair. In the Eragon movie, she inexplicably has blonde hair. This, when combined with her human features, makes it impossible to tell she is an elf (except for the fact that early in the film it is directly mentioned she is, which just reinforces the idea that otherwise, nobody would work that out). The changes of hair and ears were reportedly because the director feared a confusion with Lord of the Rings' Arwen. Which is especially funny in the latter case, as Tolkien never said his elves had pointed ears in the published texts (the only hint comes from a tiny note in an etymological dictionary about his ConLangs). Of course, it's also funny since many anti-fans accuse Arya of being an Expy of Arwen anyway. Murtagh is supposed to have brown hair in book 1. In the movie they gave him black hair. In book 3, his description backs up the movies. In the Oz books, Princess Ozma's hair is described specifically: "tresses of ruddy gold, with a slender jeweled circlet confining them at the brow." However, in John R. Neill's illustrations, her hair is either colored brown or black. Whether this is intentional (to distinguish Ozma from the blond Dorothy Gale) or simply a printer error is debatable, but most modern Oz fans, authors and illustrators portray her with brown hair or, rarely, black. Of note, too, the "slender circlet" became much thicker in the illos, and was attached to a crown on top of her head. Ozma's hair was only described once, on her original (re)appearance. After that, well, maybe The Wizard Did It. For that matter, Dorothy was played by brunette Judy Garland in the film. With her hair dyed auburn. Ozma was blonde in Return to Oz. Though Dorothy was still brunette. Possibly because people who've only seem the Judy Garland movie would accuse the movie of this trope if she were blonde. The slippers were also silver in the original book; they were changed to red to take advantage of the new colour technology. In The Worst Witch, Enid Nightshade went from being blonde in the books to having brown hair in the tv series. In the earlier television movie, Mildred (black hair) and Maud (blonde) both turned brunette. In The Vampire Diaries books, Elena was blonde. In the TV show, she is played by the dark-haired Nina Dobrev. Alba from The Time Traveler's Wife is specifically and repeatedly described as having curly black hair. That's important because she is supposed to take after her father physically. Nevertheless, her movie version has straight blonde-ish hair. The "perfect" May in The Age of Innocence is a blonde (as well as blue-eyed), while family reprobate Ellen is dark-haired. But when the book was adapted for the screen, May was played by the brunette Winona Ryder, while Ellen was played by the blonde Michelle Pfeiffer. Averted with the casting of Vivien Leigh as Scarlett O'Hara—despite the numerous references to Scarlett's black hair, a number of blonde and redheaded actresses were considered for the role. Not entirely averted. Leigh's eyes were blue, whereas O'Hara's were green. The filmmakers made some bad attempts to disguise this, though. Meggie's golden-red hair is referred to countless times throughout the novel "The Thorn Birds", but in the TV miniseries adaptation, she is played by the brunette Sydney Penny (as a child) and Rachel Ward (as an adult). Her daughter Justine is also a red-head, but played by the brown-haired Mare Winningham. In Dracula the brides are described as one blonde and two brunettes. Many adaptations change one of the brunettes to a redhead to enforce the Blonde, Brunette, Redhead trope. Inspector Tommy Lynley went from blond in Elizabeth George's novels to being played by brunet Nathaniel Parker in the TV series. Frumpy Sergeant Barbara Havers was given a complete upgrade in the casting of Sharon Small. In Deltora Quest, Jasmine was described as having black hair, but have green hair in the Anime. Similarly, Lief was assumed to be a brunette, but became blond-haired in the anime. The eponymous character of Artemis Fowl has blue eyes initially. An eye swap with Holly in The Lost Colony gave him a hazel eye. In the (admittedly black and white) graphic novels his eyes are black. In the first Princess Diaries book, Mia is described as being "dishwater blonde" and after a makeover her hair is trimmed short. In the movie, she's played by brunette Anne Hathaway. In Percy Jackson and The Olympians, Annabeth was described as having curly blonde hair. In the movies, she's brunette. She also has gray eyes in the book. Movie Annabeth has bright blue eyes. The TV series Jeeves and Wooster had a few instances of this. During the first season, the blonde Madeline Bassett was portrayed by a brunette. Both actresses who were cast as the platinum blonde Florence Craye were also brunettes. Finally, the hair of the actress who portrayed Bobbie Wickham during the first season could hardly be described as a vivid shade of red (or any shade of red unless you squinted really hard). Sharpe had black hair in the books and was from London, but blonde Yorkshireman Sean Bean was cast in the title role for the TV adaptation. Bernard Cornwell was sufficiently taken with Bean's portrayal that later books retconned Sharpe's accent and backstory, but there wasn't much he could do about the hair. In the The Prisoner of Zenda, King Rudolf, Rudolf Rassendyll, and Princess Flavia, like all the Elphbergs, have red hair; in the 1939 film, both Rudolfs are (probably) brunets (or at least one brunet, Ronald Colman) and Flavia has become "golden-haired goddess" Madeleine Carroll. In both adaptations of Lord of the Flies, the "fair-haired" (blond) Ralph is played by a brunette. In the more recent adaptation, the redheaded Jack is played by a blond. In the novella Breakfast at Tiffany's (yes, it was a novella first), Holly is blonde. The movie is freakishly accurate, besides the inclusion of the love story, but it decides to make Holly brunette. Truman Capote hated Audrey Hepburn for the role, though he thought she was beautiful, a good actress, and a good friend. And of course, all the fans agree, she did terribly. In Lloyd Alexander's Chronicles of Prydain, Princess Eilonwy is a redhead and Fflewddur Fflam was described as having "straw-colored hair." The execrable Disney version made her a blonde in all senses of the word while aging him thirty years and giving him white hair. Averted in Walt Disney's Snow White and The Seven Dwarfs. Snow White has hair "as black as ebony," just as described by the Brothers Grimm, as well as Brown Eyes. However, there do exist numerous pre-production drawings from the film, which show that the Disney animators originally considered giving her Blue Eyes and blonde hair or red hair. It seems the artists had a hard time deciding on one of the standard three hair colors. In the Twilight film Edward's "bronze" and reddish brown hair looks browner than described in the books. The Pretty Little Liars - all of them - in the television series. Tobias from Animorphs is described as blond at the beginning of the series. Then the model they hired to pose as him on the book cover turned up with brown hair, and the author started writing he has dirty-blond hair to make up for it. In the TV series adaptation, he has very dark brown hair. Gossip Girl: Jenny was originally a brunette in the books. In the tv series, she is blonde. Angelina Ballerina has white fur in the original books and first cartoon, but has pink fur in the CGI cartoon. Blond-haired Chloe Steele and Nicolae Carpathia from the Left Behind book series got darker hair in the films. Vanity Fair: The redheaded Becky Sharpe becomes a blonde in the 2004 film version. Although, Becky's hair colour might be the least of your problems with that film if you're a fan of the original novel. In Game of Thrones, Arya Stark and Jon Snow have black hair like their father Ned Stark, while Sansa, Bran, Robb and Rickon have reddish hair like their mother Catelyn. In the HBO adaption however, Ned Stark is portrayed by Sean Bean (who else) with brown hair along with Bran, Arya and Rickon. Also the dialogue would have you believe King Robert is has black hair as well, but the wigs and the beard can't quite hide the fact that Mark Addy is brunette as well. Queen La from The Legend of Tarzan is actually given tanned skin and white hair in order to keep the fact that she is originally from Atlantis. In Andrew Lloyd Webber's musical adaptation of The Phantom of the Opera, Christine became a brunette instead of a blonde, probably so Sarah Brightman could play her. The Lloyd Webber musical wasn't the first version to invoke this: Mary Philbin, who played opposite Lon Chaney in the silent film, was also brunette. The costume designer may have actually had the silent film in mind, given that both silent movie!Christine and her stage musical counterpart aren't just brunette, but have cascading frizzy curls. Interestingly enough Meg in the original novel was brunette and became a blonde in the musical. In the Hungarian production of the show, Meg is sometimes brunette. Chrsitine is sometimes blonde. It all depends on the actresses. Many casts of Les Misérables have someone who doesn't have the right hair colour as described in the book. Enjolras should have blonde hair, though many actors such as Michael Maguire do not, and Cosette should have dark hair, whereas for the current 25th anniversary tour cast and on the current London stage she is blonde. A lot of productions do manage to use a blonde wig for Fantine though. It's not mentioned often in the novel, but in The Devil Wears Prada Andrea is blonde. In the movie she is played by the dark-haired Anne Hathaway. Collodi's novel The Adventures of Pinocchio has the Blue-Haired Fairy. Disney's 1940 film adaptation Pinocchio has a blonde Blue Fairy dressed in blue. 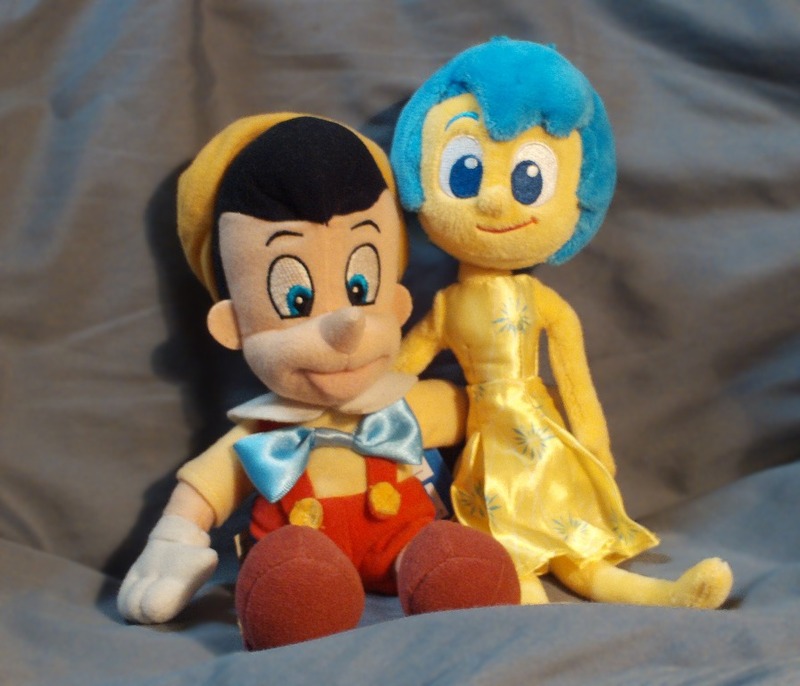 A novel-accurate Blue-Haired Fairy would look more like Joy from Inside Out. Dax from Power Rangers Operation Overdrive went from having black hair to having it gain a blue tint in the UK comics. In Star Trek: The Original Series, Kirk's eyes are hazel and McCoy's are blue. In the reboot movie it's the exact opposite. In Norse Mythology, Thor had red hair, but The Mighty Thor turned him into a blond. An all-Asian production of Sweeney Todd: The Demon Barber of Fleet Street who thought a blonde wig would look odd on a clearly Asian actress steered around the problem of Johanna's frequently invoked Hair of Gold by simply changing all references to her "yellow hair" to "raven hair" and removed the Wigmaker's Song (which lists several different shades of blondness, so Anthony will know how to refer to Johanna's particular hue) entirely. A production with a redheaded Johanna similarly removed the Wigmaker's Song and changed "yellow" to "fiery". Another production had a Johanna that was clearly a brunette, yet kept the Wigmaker's Song and all references to yellow hair, much to the audience's confusion. Vanities originally portrayed Joanne and Mary as blondes and Kathy as a redhead. The 2000's musical version made Joanne a brunette, resulting in a Blonde, Brunette, Redhead trio. In turn, the ACT Theatre production in Seattle switched Joanne and Kathy's hair colors to better correspond with their personalities. Oddly, a promotional shot of the finale from the Pasadena Playhouse version has Joanne and Mary's hair colors switched, as they were supposed to change their hair colors in-story, but they ditched the wigs and kept the actresses' normal hair colors for the actual production. Happened a lot with old Nintendo cartoons, and adaptations of Nintendo stuff in general: Peach, Link, and Zelda all got light brown hair for their cartoons. In Peach's case, it looks like she was based on her NES sprite, not any official art of her which has always depicted her as being blond. Link and Zelda have pretty much touched upon all possible natural hair colors throughout the series. Zelda has been pinned as blond, dirty-blond, brown, strawberry-blond, platinum blond and redheaded in one game or another, while Link has had blond, strawberry-blond, dirty-blond, brown, and (thanks to a coloring error) pink hair. The current trend seems to be towards some variety of blond for the both of them. At least there's a ready excuse, since there are many different versions of the characters. A manga adaptation to the first game has Link with blond hair, when he is a brunette in said game. An adaptation of the second game by the same mangaka has him with pink hair, despite him being the same Link. In Super Mario Bros. 2, Mario wore red overalls with a blue shirt, while Luigi wore green overalls and a blue shirt. In Super Mario Bros. 3, the colors of the overalls and shirts were switched, giving both brothers blue overalls and shirts of their respective colors (for some reason, their sprites were both depicted with black overalls) and they have remained that way since, although in the cartoon versions of Super Mario 3 and Super Mario World, they still used the Super Mario 2 color scheme. And in the original Super Mario Bros game, Mario wore a red hat and overalls and a brown shirt, while Luigi wore a white hat and overalls and a green shirt. Interestingly enough, Luigi's SMB colors are actually that of his current fiery form as his original fiery form depicted him as having the exact same sprite as fiery Mario (white hat and overalls and red shirt). 210000) shirt, green overalls, and green hat. And then there's Samus. While canonically, she has always been blond, the very first game allowed you to see her without her suit using a code. Because of the need for a visual representation of what powers are equipped, her hair had a wide assortment of colors, leading many people to come up with alternate hair colors for her. The official ending of the game shows it to be blond. When adapted into a short comic for Nintendo Power to promote Super Metroid, her hair was purple for some reason - especially unusual considering that Super Metroid was the first game to consistently portray her blond. Pauline was originally depicted as a blonde in illustrations for the arcade and Famicom versions of Donkey Kong, but became a brunette in Donkey Kong 94, presumably to distinguish her from Peach (who at that point was already a more popular character than Pauline). Bill has brown hair in the Pokémon games, but in the anime it was green. The first protagonist, Red, had black hair in the original games. Come the remakes and he has brown hair, to more resemble his Distaff Counterpart Leaf. One of his manga counterparts, Shu, had green hair (though he looks vastly different from Red). Dawn's and Lucas' hair colors are brighter in the anime then in the games. Volkner's hair is a more dirty blond in the anime, probably to avoid legal issues with Naruto like they did with another character. Morty - In old promo art of Gold, Silver, and Crystal, he has blond hair. In the games proper, he has white hair. In the anime, he has orange hair and is later shown with blond hair during a flashback in a Lyra episode. In Pokemon Stadium 2, he has brown hair. In the remakes, it's back to blond. May in the games has brown hair. Her Pokémon Special counterpart appears to have grey hair at a lot of times. Likewise, Kris always had blue hair in the games. Her Pokémon Special counterpart kept on changing between brown hair and blue hair, and her Pokémon Golden Boys counterpart has green hair [dead link]. Erika has black hair in the games, but blue hair in the anime. Brendan has apparently black hair, with a white knit hat; it's unknown what his hair is like under the cap, but most people think it's just normal black hair. His Pocket Monsters counterpart apparently has black-and-white hair. Eye variations appear often in all media. The protagonists of the games always have Brown Eyes or Blue Eyes, but their Special counterparts have eyes that often match their names, Gary has Green Eyes while Blue has Brown Eyes, Isamu from Pocket Monsters has Green Eyes when Red has Brown Eyes, Misty has Blue Eyes in the games when in the anime it keeps on switching between that and Green Eyes, etc. Happened in the early installments of the Final Fantasy series, where many characters (most notably Terra) who were blond in Amano's concept art had a different hair color so the sprites would be distinct. A straighter example is Dissidia Final Fantasy, where characters from the first six games are redesigned from their sprites to appear more similar to Amano's original designs. Terra, for example, has her hair change from a greenish teal to blond. Cecil and Firion both have hair that goes from blue to white. Oddly Bartz remains fairly faithful to his sprite, as his hair is still brown. In most cases, you can obtain different outfits that make them appear closer to their original looks. Montblanc from the Ivalice games, seems to have orange hair and yellow fur in his game sprites. In the artworks and portrait sprites, he has blond hair and brown-peach fur. This also happened to Hurdy's hair, but averted. Also, the enemies in the game Super Mario All-Stars. For example, the gray Cheep-Cheeps in SMB were changed to green, and the Bloopers from white to for some reason, pink; and the pink Shy Guys from SMB 2 were changed to blue. Also, the Piranha Plants will all either be colored green or red depending on which game they are in. And the Koopalings' shell colors. In Super Mario Bros 3, all of them wore green shells, except Morton, who wore a gray shell, and both Roy and Wendy, who both wore pink shells. In Super Mario World, Morton's shell is now colored green like everyone else's, and Roy's shell is now colored gray, while Wendy still wears a pink shell and everyone else still wear green ones (although Ludwig's sprite for some reason had him wear a yellow shell). In an early draft of Super Princess Peach, Roy's shell is now colored green like everyone else's, with the only Koopaling that has a differently-colored shell still being Wendy, who is still wearing pink, but from New Super Mario Bros. Wii onwards, all of the Koopalings are given individually colored shells, with the only Koopas sharing the same color shell being Bowser and Bowser Jr.
Phoenix Wright ends up with blue eyes in the English version, but his other features (including hair color) stayed the same. The English version of Persona says hi. This caused some scratching of heads when Persona 2 got a more faithful localization as some players wondered how Ellen went from blonde (in the North American version of the first game) to brunette (the color of her hair in Japan). The Japanese fans probably just wondered how she went from purple to brunette. The illusory Pierce Boy also gained back his wild blue hair (Again, You Gotta Have Blue Hair), not to mention the earring he didn't actually have in the US version of Persona. In the Street Fighter cartoon, Ken's hair went from blond to brown. Ryu's hair color, which is normally black or brown, is depicted as red in SF I, as well as in the Alpha series, while Vega's hair color seems to vary between brown or blond depending on the artwork. Well, Vega started out with brown hair, but at some point (possibly from Street Fighter II: The Animated Movie) he was made blonde and it stuck (except for SVC Chaos, at least). Another anime, a movie based off Alpha, changed Ryu from having Brown Eyes to Blue Eyes. Tails in Adventures of Sonic the Hedgehog and Sonic Sat AM. Orange/yellow in the video games, anime and most artwork; brown in the American cartoons. He seems to switch randomly from orange/brown to pale yellow depending on which game you're playing, too. Almost everyone had an eye color change in Sonic the Comic, once it went to Sonic Adventure. Tails had Brown Eyes for most of the arc, Amy had brown eyes, and Knuckles had blue eyes. In the Archie comics Amy had Purple Eyes early within the Adventures series for some reason. In the original arcade version of Double Dragon, Billy (the Lee brother in blue) has blond hair while Jimmy (the one in red) has brown hair. When the game was adapted to the NES, their hair colors switched: Billy was given brown hair (although, depicted red in-game) and Jimmy has blond hair instead. The arcade sequels (including the Neo-Geo version) would retain the original hair colors for the most part (the only exception being the ending picture in the second arcade game), while most of the later console games (including the ones for the SNES, PC Engine, and GBA) would use the switched style from the NES games, eventually changing their hairstyles as well. The Master System version had Jimmy with blue hair instead of blond. Most likely the developers of the SMS port used the opening of the NES version for reference, which depicted Jimmy with blue hair instead of his usual blond. Simon Belmont's hair has been brown, blue, pink, black, blond and red thanks to the various depictions of him in cover arts. Eventually Konami settled on red when Ayami Kojima redesigned the character in Castlevania Chronicles. The Japanese version of Pokémon Battle Revolution only let you create characters of one skin tone, but the American version lets you choose from three skin tones. With this new feature, boss character Rosie is also changed to be darker skinned than she was. Space Quest: Roger Wilco changed hair color from brown to blond in the fourth game. In the original 16-color release of The Secret of Monkey Island, love interest Elaine Marley had black hair. In the upgraded 256-color re-release this became red hair with blue eyes, which carried over into The Curse of Monkey Island. In the latest installment, Tales of Monkey Island, Elaine has red hair and Green Eyes. In Escape from Monkey Island, her hair was usually light brown, except in the cutscenes where usage of a different model changed it back to red several times. Guybrush himself has also had this, appearing brown-haired in the first two games, and in the close-ups in the first being black-haired with brown highlights in the original 16 colours. The 32-colour update changed the close-ups to the blond of the cover, a change which carried over from Curse onwards. Every Metal Gear game has depicted Solid Snake with brown hair. However . . . In the first Metal Gear Solid, his clone-brother Liquid has blond hair, and in the briefings, Campbell says "Except for the skin tone, he looks exactly like you." The briefings are monotone, so it's hard to see, but Snake looks fair-haired. It seems possible that when he cuts his hair to look less like Liquid, he dyes it too for good measure, and decides to keep the look for MGS2 . . . But in the GC remake of MGS, The Twin Snakes, his hair is clearly already dark in the briefings. Also, he and Liquid are clones of Big Boss (Naked Snake), and MGS3 and Portable Ops depict him with brown hair. It could be that Liquid is the one who dyed his hair to be less like Snake. In that same remake, the normally red-headed Meryl becomes a brunette, while Sniper Wolf's odd, slightly greenish hair becomes straight-up blonde. Syphon Filter: Mara Aramov was a brunette in the first game, but blonde in all subsequent games, even in the flashbacks in the third game. Duke Nukem has always had blond hair, however his skin colour has changed twice. In his original trilogy, he had red skin (due to EGA pallete limitations). In Duke Nukem II, with a jump to 16-colour VGA, it was changed to a light brown. Duke Nukem 3D finalised his appearance with his characteristic tanned skintone. In the opening animation for Wild ARMs 3, the anime style changes 3 times. So does the girl's hair color. In Perfect Dark for the Nintendo 64 title character Joanna Dark had brown hair, in the sequel Perfect Dark Zero for Xbox 360 she had red hair with a blonde patch. The developers claimed that the Nintendo 64 didn't have the technological capabilities for red hair - ignoring the many red objects in the game. Fans thought the developers were just liars who didn't want to admit to a character redesign. The majority of the promotional artwork for Joanna Dark depicted her with a burnt red colour. This was changed again in the Xbox 360 remake, turning her into a brunette. Glass Joe in the Punch-Out!! series has different hair in each appearance. It's dark brown in the arcade, blond in the NES, and reddish-brown on the Wii. Wing Commander's Todd "Maniac" Marshall started out with darker hair. While the jump to Full Motion Video kept close to that with Tom Wilson, in the 1998 movie Wing Commander, Maniac was depicted as blond. In Police Quest Sonny dyes his hair to go undercover, and retains the blond hair in the sequel, but returns to being a brunette in the third game. In Resident Evil 1 and Resident Evil 3: Nemesis, Jill Valentine has brown eyes, but in the RE1 remake and 5 she has blue eyes. In the Higurashi no Naku Koro ni sound novels and manga, Keiichi has blue eyes, the exact same shade as Rena's in the manga, but darker (and with a slight purple shade; mostly in the remakes), in the sound novels. In the anime however, they're full-on purple. A larger example is in the live action movie adaptations. All the oddly colored characters have "natural" colored hair. Cue Internet Backdraft here. Which is ironic since they would have looked like oddly dressed cosplayers. The backdraft is because you can't tell the girls apart. Rika has short hair, Satoko has longish hair, and the teens look similar if they aren't in their Higurashi costumes, which they usually aren't. Umineko no Naku Koro ni's anime adaptation changed basically everyones eye color, which didn't work well since it was plot related. The Touhou fighting games change some of the colours. Mostly eye colours, which aren't always consistent even in the shmups, but Remilia went from pale blue hair to dark purple. Mai from the Makeruna! Makendou series (or "Josephine" if you've played the first game's American release "Kendo Rage", which was the only installment to reach North America) always had brown hair throughout the four-part franchise, except for in said first game, in which her hair was red. That was only in that game, though, and it was still brown in the Japanese box art. Word of God for the Myst series is that Atrus has the characteristic D'ni eyes, which are consistently described as "pale". This requires anyone playing the games to ignore Rand Miller's dark-hazel eyes. In There Will Be Brawl, Ike is given black hair, likely to differentiate him more from Marth. The Nostalgia Chick pointed out that the real life John Smith from Pocahontas was short, portly and brown-haired, unlike the tall, blond Adonis we get in the Disney adaptation. Of course, knowing John Smith, he wouldn't want it any other way. In the Japanese dub of the G1 cartoon, the error was corrected by reversing the characters' names identities, which worked well since they were basically depicted as interchangeable anyway. Most depictions of Arcee are portrayed as being colored pink, but in Transformers Prime, Arcee is colored blue. Preliminary photos from the live action movie adaptation of Avatar: The Last Airbender show that the costumes of the characters have been seriously toned down. The movie tries to justify it since bringing the bright colors of the cartoon into the relatively muted real world would make the characters look cartoony, which ignores the fact that many of the cartoon's brightly-colored costumes are based on real-world outfits. A similar justification is given for the relatively muted costumes in the X-Men films. Really noticeable change in character design is present in Wakfu and its Noxmillen special. The eldest (judging height-wise) child and Nox's wife had black hair in the series, while being blonde in the special in addition to the wife's massive character redesign. The Dinoco logo's appearance and design actually varies depending on which film it appears in. In the Toy Story series films, it's colored red and features an Apatosaurus (just like the logo of the now-defunct Sinclair Oil company, which looks similar), but in the Cars series films, it's instead colored blue and featues a Tyrannosaurus Rex (the name Dinoco comes from the Sunoco Oil company, the official fuel of NASCAR, which is also colored blue). In a rare instance of a release-related dye job, Pizzazz of Jem was always depicted in doll and animated form with bright green hair. The R1 Rhino masters inexplicably changed her hair color to a dull olive blond - and also redid the green parts of her costume to match this. In a doll-related change, the title character is known for her pink hair, but the dolls were always blond. 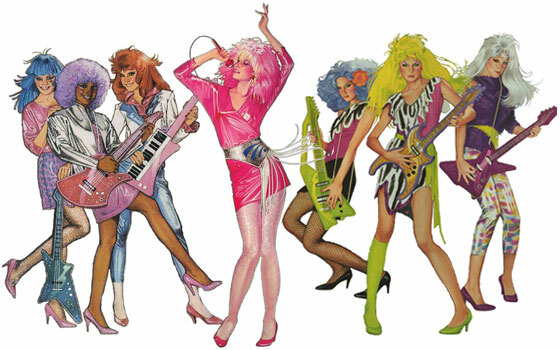 Promotional art for the show (such as this) that showed up on places such as doll boxes and VHS covers depicted a realistic art style gave Jem predominantly pink hair, but added blonde bangs. All of the characters also had more "realistic" hair styles for the period, but were still reasonably close to their animated and doll line styles. Most of the eye colors for the Alvin and The Chipmunks characters were changed for the Alvinandthe Chipmunks movie. Theodore went from having Blue Eyes to Green Eyes, Alvin has brown eyes instead of blue, Jeanette has Violet Eyes instead of Green Eyes, Britanny has green eyes instead of blue, and green eyes instead of Brown Eyes. Sherlock Holmes is typically a brunette but in Sherlock Holmes in the 22nd Century he has dirty-blond hair. Many dinosaur picture books will actually have the dinosaurs colored differently in each book depending on the illustrator. This is because no one really knows what color dinosaurs really are, so it's up to the illustrator's imagination to determine what they really look like. Similarly, many astronomy picture books and clip art will often portray Mercury as being bright orange and Pluto being steel-blue despite both being gray in real life. Though Pluto is mostly orange on its southern hemisphere. Its largest moon, Charon, however, is completely gray like Mercury. This page was last edited on 25 October 2018, at 00:00.